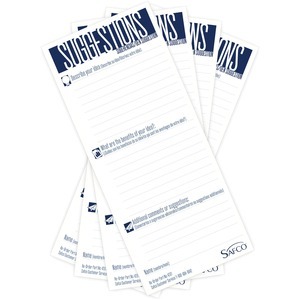 Suggestion cards are designed as a refill for Safco's Suggestion Boxes. Card heading reads "Suggestions." The encouraging subheading of "Help us ... Help You!" offers a win-win attitude. Thought-provoking prompts below help participants outline their suggestions. They include: "Describe your idea"; "What are the benefits of your idea"; and "Additional comments or suggestions." The bottom of each card offers a place for the participant name.